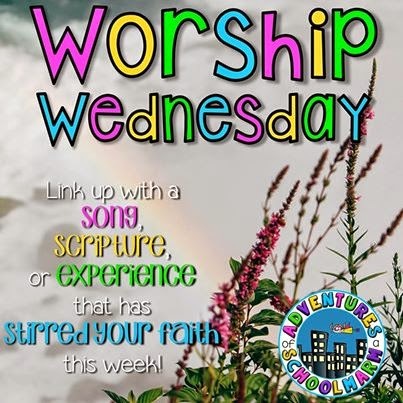 I am linking up with my blogger friend, Beth, at Adventures of a Schoolmarm for Worship Wednesday. This is a new linky that I am super excited about. I mean, who doesn't need some uplifting on a Wednesday? I know I do. So here is one of my favorite scriptures. I have a hard time letting go and letting God. Anxieties seem to sweep in and flood my mind and my soul. This is one of the scriptures I have learned to try and remember that God is in charge even when my heart is anxious and worried. It helps to remind me that I need to delight in Him. That if I shift my focus from my problems to Him, He will quiet the loudness around me and bring comfort and peace to my soul. I almost see it as a tornado surrounding me. Stuff flying every which way, swirling and twirling, no end to the turning and churning. Like I am gripped in the clutches of everything that is going on around me. But if I look UP instead of out at all the turmoil, I can find peace in the storm. The storm becomes just background noise that is quieted by His peace and comfort. I usually read the New King James Version so I can understand everything but keeping as close to the King James Version as possible. Therefore, the graphic is in that version. These other versions offer a slightly different outlook and may speak to you more though. Psalm 94:19 The Message (MSG) When I was upset and beside myself, you calmed me down and cheered me up. I struggle with letting go of worry, too. There is so much thrown at us all day long- great verse to remember! JUST what I needed to hear! Thank you!! !